Home parenting It’s all about Sight this week. It’s all about Sight this week. This week is a big week in the world of visual impairment. This week sees the "Let's Glow" week for Guide Dogs UK and on Thursday 8th October, it is World Sight Day. Every hour another person in the UK goes blind. Guide Dogs UK need your help to make sure that when someone loses their sight they don't lose their freedom as well. This year the theme for Guide Dogs Week is 'Let's Glow' in tribute to the famous neon flash on the guide dogs’ harness. 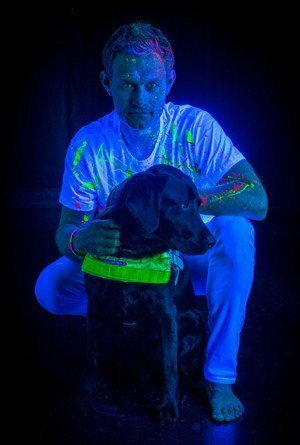 Coronation Street star Ben Price, Sky Sports presenter Natalie Pinkham and Paralympian Libby Clegg allowed themselves to be covered in neon paint in support of this year's Guide Dogs Week theme - 'Lets Glow!'. Guide Dogs UK are asking people to get involved and to Glow on "Let's Glow Friday"! You can find out more details on their site. What can we do to bring eye care to everybody? How can we ensure that access to eye care is not limited by gender, geographical location or even financial status? Eye Health includes rehabilitation and assistive services for those with irreversible vision loss. IAPB are also running an #EyeCareForAll photo competition. All entries have to be in by tomorrow (8th October) and then will appear on IAPB's social media where the general public get to vote on their favourites. It's easy to enter and open to everyone - you don't have to have a child with a visual impairment, just an image that you think says #EyeCareForAll. What one thing can you do for families like mine? As you know, my youngest son J is blind due to being born prematurely. 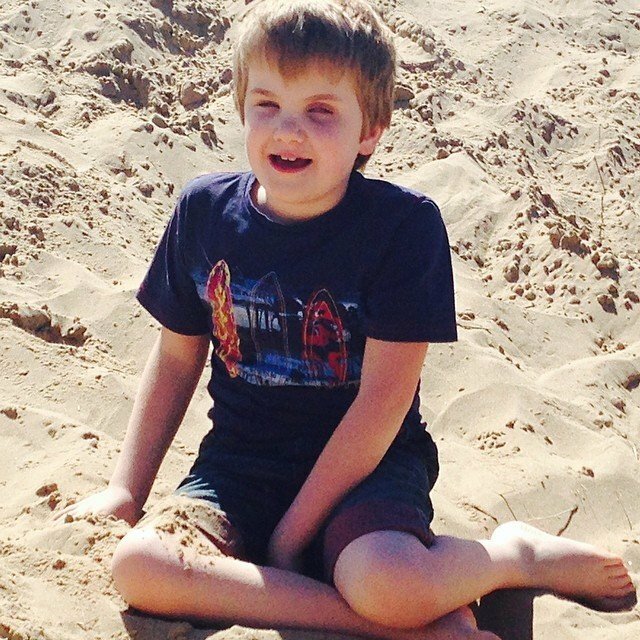 It's a steep learning curve as a parent, in the same way it is for all parents who have a child with a disability or SEN. However, the issues we face with J are very different to some of the issues we face with K. People can close their eyes and imagine how it would feel to be blind. You can't really imagine how it would feel to have autism in the same way. So J gets more sympathy. This sounds great until you think about the fact that this can hinder his development. I have been on the receiving end of some awful lack of understanding about Autism so you would think I would embrace this sympathy and adjustments. However, when people feel sympathy, they often make allowances which they really shouldn't. I remember sitting on a train one evening, in rush hour, and a very tired, grumpy business man sat opposite us on the table. Initially, as J was facing me and asking his million questions (is this a fast train, is it a slow train, are the lights on, are the lights off, is the engine high or is the engine low, etc), the man just saw a chatty little boy and rolled his eyes. You could see that look on his face, the one that said "oh great, just the perfect end to a perfect day, a chatty child" but then I saw him notice J's white cane. He immediately looked awkward, even guilty, and then started to chat to J about the train and where he had been that day. As the journey progressed, I looked down and realised that J's feet were not where I expected them to be and then realised they were actually on the business man's lap! I immediately told J to take them down, only for this man to say "oh it doesn't matter, it's fine, honestly" but it's not fine and it does matter. J cannot live his life believing that everyone is there for his convenience and comfort (and believe me, he would love that to be the case). He needs to learn independence, social skills and manners. Like all children, he will one day be an adult and he won't be able to put his feet up on strangers then, not without it being a big issue. As a family, we welcome awareness of the issues around eye care and the need for independence and freedom being raised; we also need people to be aware that our children are children first. Make the necessary allowances, e.g. say his name as you start speaking to him so he knows you are chatting to him; don't throw a snow ball at him without giving him a heads up (yes, mea culpa) and be slightly more precise with instructions (e.g. "the loo is at the top of the stairs" may require a little more detail). However, don't hinder them by allowing behaviour that is not acceptable. J is a charmer, he is hugely sociable and given his constant interaction with adults, he is very articulate and mature. He has a vast knowledge of the Beatles and Pink Floyd and can discuss their history at length (and I really do mean at length). All of this means that people forget he is still a child and needs to develop through experiences with his sighted peers. It also means we need to educate him about when those experiences are not appropriate. Like all 9 year old boys, J absolutely loves the topic of bodily functions and has been known to virtually stop breathing due to laughing so much at "bottom burps". This may be great fun and acceptable in the playroom with his siblings or in the playground with his friends but it's not great when you're sat in a nice restaurant or in the local church for a christening! However, even there, people just smile and say, "Oh bless him, it's okay" while glaring at me if K dares to speak loudly. So please, if you can do one thing for families like ours, stop staying "it's ok" when it isn't. If you wouldn't accept it from a child the same age with vision, then don't accept it from one without. Make the necessary allowances for his loss of vision but that's it. This also means that I, his Mum, am not always the bad guy who has to say "no, it's not ok" when others appear to be happy with his behaviour. As the proverb says, "It takes a village to raise a child"; so please, be part of our village.